It's a major expense to replace an old roof with a new one. In addition to finding a good contractor who will complete your re-roof job for a reasonable price, you may need to decide whether or not you want the new roof to be the same type as the old. Roofers Nation provides the best value in roof replacement for home and business owners throughout Missouri and Illinois. How do I know what’s best for my home? The condition of your roof is important for obvious reasons. Whether you need repair work, new gutters, or a new roof, it’s smart to deal with an established, full-service roofing contractor. Together you can consider your budget, how long you plan to live in your house, and other factors in order to establish your best course of action. Replacing concrete tile roofs. When an old concrete tile roof develops enough leaks or broken tiles to justify roof replacement rather than spot repairs, homeowners often choose to have a less-expensive roofing material installed –like asphalt shingles, for example. But if the new roof is to be concrete tile, homeowners need to choose between several commonly available tile shapes. When the old roof tiles have been removed, the roof structure can be inspected and repaired as necessary. Then a new waterproof roof membrane can be installed before the new roofing goes on. Replacing a wood shingle roof. A wood shingle roof never wears out evenly, since some areas of the roof receive more exposure to the weathering effects of sunlight and moisture than others. When spot repairs become necessary on an ongoing basis, many homeowners elect to have the entire roof replaced. Today many roofing contractors recommend installing a "rainscreen" material beneath a wood shingle roof, instead of nailing the shingles directly against the roof sheathing. The resilient rainscreeen material creates an airspace beneath the roof shingles that promotes drainage and drying. 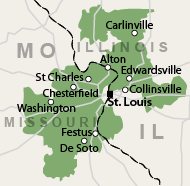 We work in St. Charles, Florissant, Ballwin, Saint Louis, Chesterfield, O Fallon, Granite City, Saint Peters and nearby in Missouri and Illinois. Call us today!